Posted September 17, 2018 by finnfemme & filed under Beauty, Daily Life, Fashion, Vintage. Maybelline Waterborne Eye Shadows, 1971. Pale pastel eye shadow was the look in the early ’70s. It was all about “a new wave of colors”, but they had to be muted. 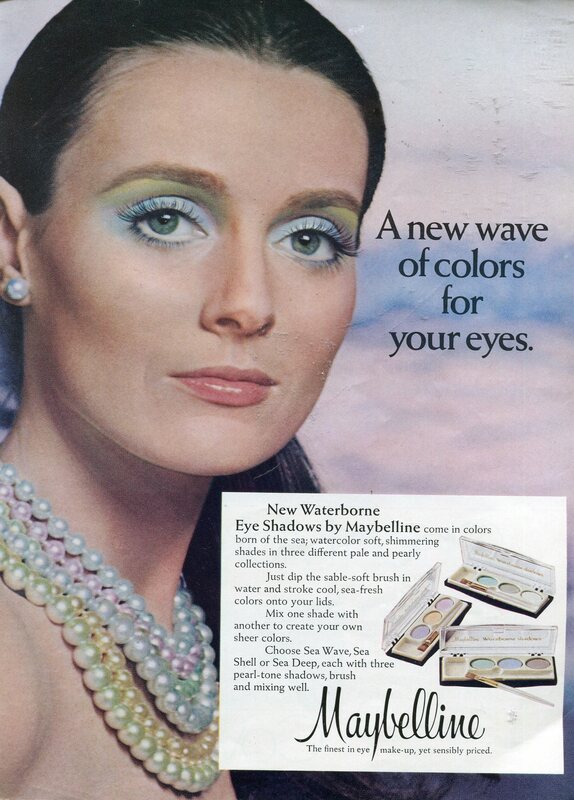 This 1971 ad for Maybelline Waterborne eye shadows shows the model wearing blue, pink, yellow and green shadows, with corresponding pearl necklaces. 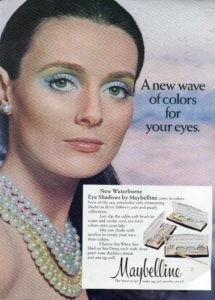 Waterborne eye shadows came in collections of colors borne of the sea – Sea Wave, Sea Shell or Sea Deep. They each came with three pearl-tone shadows, brush and mixing well. 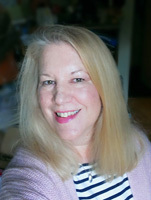 You dipped the sable-soft brush in water and stroked cool, sea-fresh colors onto your lids. You could mix one shade with another to create your own sheer color.